More than 30 bars are on the verge of closing as a result of the ban on smoking in entertainment venues, according to the Hong Kong Bar and Club Association. Massage and mahjong parlours have also been hit hard, the industry says. Business at bars and pubs had dropped 20 per cent to 40 per cent since the smoking ban came into force, the association said. Business at massage parlours had halved, according to associations representing the sector. Most mahjong parlour operators interviewed said their business was down by about a third. Some 30 or 40 bars, out of a total of 800 in the city, could close in the near future, Hong Kong Bar and Club Association vice-chairman Chin Chun-wing said. Up to 10 bar owners had sold their businesses recently. 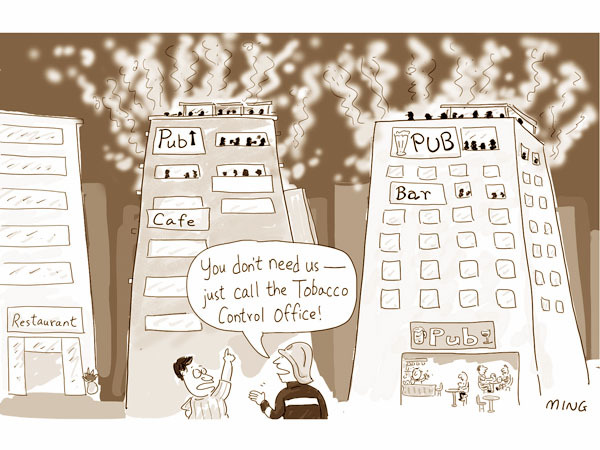 While some smokers said they now preferred going to upstairs pubs – some of which are turning a blind eye to the ban – Mr Chin said others had simply stopped going to bars. Charlie Chair Sai-sui, a 25-year veteran of the industry and operator of the Schooner Pub & Karaoke in Tsim Sha Tsui, said he was making a loss of about HK$30,000 a month in an industry that was experiencing a “bloodbath”. At Delaney’s Irish pub in Tsim Sha Tsui, general manager Colin Williams said it was too early to judge the smoking ban’s effect, as “July is notoriously bad anyway”. He estimated receipts had dropped 5 per cent because daytime customers were no longer stopping by for a cup of coffee and a cigarette. Other patrons, however, were now bringing their children to the pub and that was helping offset losses. Also, evening customers, mostly overseas visitors, were “used to these [smoking] bans already”, he said. Chow Chun-yu, chief executive of the Hong Kong Licensed Massage Association, said customers would rather go to mainland parlours because they could smoke there. A supervisor at the Tai Sam Yuen mahjong parlour in Sham Shui Po said the smoking ban had been more damaging to the business than the global economic crisis. It had caused business to fall by a fifth and the parlour could close at any time. And a general manager at mahjong parlour operator KC City said business at her eight parlours was down 40 per cent compared to July last year. Four-fifths of customers were smokers, she said. But James Middleton, chairman of Hong Kong-based Clear The Air’s anti-tobacco committee, said smoking bans had not hurt the catering industry in other countries. Overall, till receipts in places that had enforced smoking bans had stayed the same or, in most places, risen by 5 per cent to 12 per cent, he said. Hong Kong had seen “the biggest up” in business, even with a partial ban, of any city, he said. One reason for the increase was that Hong Kong families were able to bring their young children to the smoke-free establishments, he said. Patrons of bars and entertainment venues are flouting the ban on smoking in such places a month after it took effect, with some operators saying they can’t stop them from doing so and others apparently providing ways for them to bend the rules. While venues in popular entertainment areas open to the street are mostly smoke-free, the haze gets thicker in upstairs pubs and places away from busy tourist locations. Operators of traditionally smoke-filled mahjong parlours in particular say they have a tough time persuading customers not to light up. “We are stuck between the customers and the government. We are the men in the middle,” Hui Chak-man, manager of Sham Shui Po Ho Kong Mahjong, said, adding he had given up trying to stop customers smoking after fruitless attempts. Of 210 complaints received and 15 summonses issued by the Health Department’s Tobacco Control Office since July 1, 112 complaints and 15 summonses related to mahjong parlours. In addition, 20 complaints and four summonses went to designated mahjong rooms in clubs. The office received 68 complaints and issued three summonses for offences in bars. Massage centres and bathhouses followed, with nine and one complaints respectively. Post reporters found smoking pub-goers in Causeway Bay were moving upstairs to dodge inspectors. They also noticed that the farther away the bars were from the busiest streets and tourist areas, the more customers were breaking the ban. In Lan Kwai Fong, no customers were seen smoking in bars or clubs on the ground floor. But a table in the front of a bar in Wyndham Street had one end sticking out into the street with an ashtray on it. Drinkers said they had seen people smoking inside and facing outside and using the ashtray. At another pub on the same street in Central, once known for its hookahs, or water-pipes, customers were sitting inside the shop smoking a hookah on a table top, half of which was also outdoors. But the operators said they no longer provided the devices and customers had brought the hookah and moved the table themselves. As the clock ticked past 1am, two men were seen smoking at a bar in SoHo, Central. The smoking customers said they were not worried by the smoking ban and had no intention of refraining from smoking in bars. But they said they usually avoided ground-floor venues and instead visited upstairs bars, where they were less likely to be caught. A check of the strip of trendy bars along Knutsford Terrace in Tsim Sha Tsui found most people were complying with the ban and lighting up in outdoor seating areas. Only one person was seen smoking inside. He entered a bar with a lit cigarette and took a quick puff as he made a beeline for the washroom. Medical sector legislator Leung Ka-lau was not sure if fewer people smoked after the ban. Nevertheless, he reminded smokers that they faced a higher risk than non-smokers of sudden death from heart attack. Smoke rises, and these days so do smokers. As the month-old ban on smoking in all indoor entertainment venues takes hold at street level, smokers are moving to upstairs premises where managers either turn a blind eye or have given up trying to stop their patrons lighting up. Pub checks by South China Morning Post reporters this week has found few people dare to smoke in bars on the ground floor in Central and Tsim Sha Tsui. But upstairs – including one high-rise building in Causeway Bay that has several pubs – it is a different story. On Wednesday night, a handful of customers were seen smoking as they drank at one of the upper floor pubs where ashtrays were available. Asked why smoking was allowed, the manager, who identified himself as Jaime, said staff could do little if customers insisted on smoking. “We tried to advise regular customers not to smoke when the smoking ban came into force. But it was hard for us to keep pestering them … so if they don’t listen to us we give up,” he said, adding that ashtrays were not put out on tables but could be picked up from the bar. The scene was similar at two other pubs on upper floors of the building. The ban is being felt elsewhere though, with operators saying more than 30 bars could close soon because of lost business. Massage centres say business has dropped by half and mahjong parlours report a drop of up to 40 per cent.